Dive in to the stunning Costa Brava! 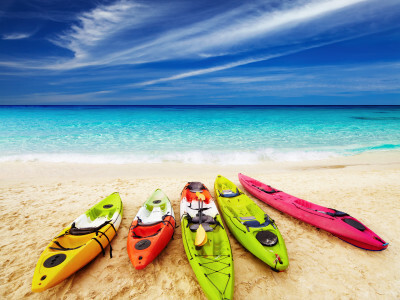 While you’re living it up on your mental stag do in Barcelona, you’ll have the Mediterranean at your toes – explore it with a kayaking and snorkelling tour! This daytime activity is jam-packed with adventure around the Costa Brava: you will explore the crystal clear blue waters of the Mediterranean together via kayak, you’ll kick back on stunning, pristine beaches and swim alongside a massive variety of fish! Your day begins by leaving a small beach that has stunning cliffs, and from here you will make your way by kayak to explore little coves and caves. Cool off and hop in the sea whenever you like – you’ll need the refreshment with the hot sunshine! At the nature reserve you begin the snorkelling adventure, seeing unbelievable and exotic fish doing their thing around mind-blowing rock formations. Back at the beach, enjoy a game of volleyball if you have the energy! A fresh, delicious picnic is provided so that you can get your energy back too! You will enjoy a private air-conditioned bus, and throughout the tour you will be accompanied by an experienced, English-speaking guide. All your gear is sorted out for you, including life vests, and a picnic lunch is provided. Bear in mind that this event will be enjoyed alongside other groups, but get in touch to discuss organising a private tour!